Bacon + Content Marketing = Success! Bacon is nostalgic: Think back to when you were a kid and your mom would make you pancakes and bacon; good memories, right? A good content marketer will want to use the same strategy to hook you. Connect what you’re writing about to something that evokes nostalgia, and you will be more likely to gain your audience’s attention. People always respond to emotion versus straight facts. 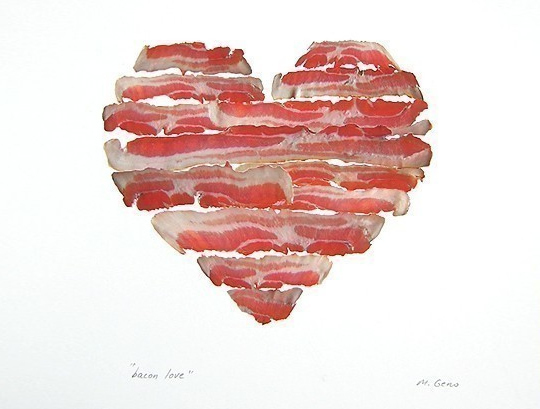 Bacon makes everything better: Bacon serves as an accessory to a lot of average foods. Bacon-wrapped hot dogs, bacon cheeseburgers, etc. Putting a different spin or adding on something that is often blase will be easier for you, and more enjoyable for your audience. Bacon doesn’t take itself too seriously: There are a bunch of bacon-related products out there: bacon band-aids, bacon books, bacon stuffed animals, all in the interest of a good laugh.While it’s important to be serious when the situation calls for it, it’s also equally important to have a good sense of humor and roll with the punches. Bacon is surprisingly diverse: According to Miller, bacon has 18 different ingredients that give the meat its delicious taste. Push the limits with your content, do the unexpected while still keeping your core message and in tact. No doubt your audience will love you for it.